Happy Fat Tuesday! It's time to celebrate. In Western Christianity Fat Tuesday or Shrove Tuesday or Mardi Gras is the Tuesday before Ash Wednesday, which marks the beginning of Lent, a forty-day-long liturgical season of fasting and prayer before Easter. Tradition holds that during Lent all meat and dairy products were forbidden. No meat and no dairy products = no rich foods. No rich foods = no pancakes or doughnuts. Hence the need to par-tay. 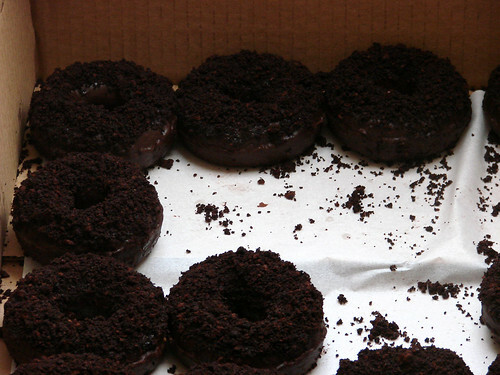 Doughnut Plant: You want doughnuts? 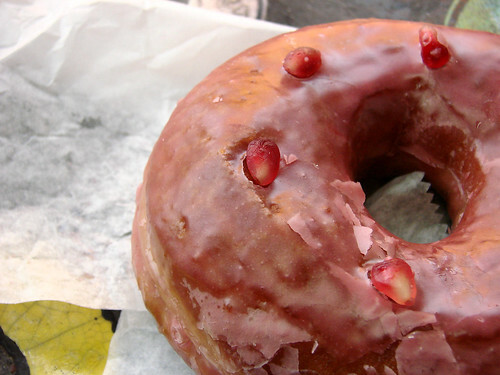 Doughnut Plant is all about decadent and delicious doughnuts. The Valrhona Chocolate Yeast Doughnut is to die for, but you really can't go wrong with any of the doughnuts there. 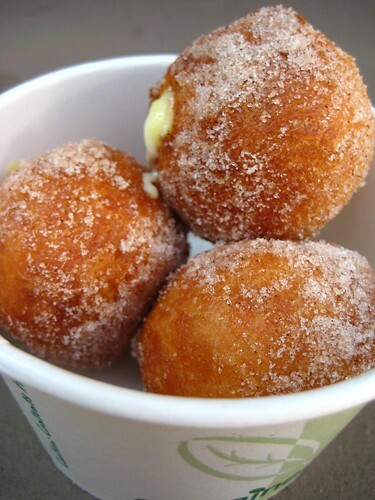 The Dessert Truck: Bomboloni/Warm Brioche Doughnuts from the Dessert Truck are a new favorite for Blondie. And how could you not like doughnuts that come from a truck? Lefkos Pirgos: Greek Orthodox Lent doesn't begin until March 2nd. 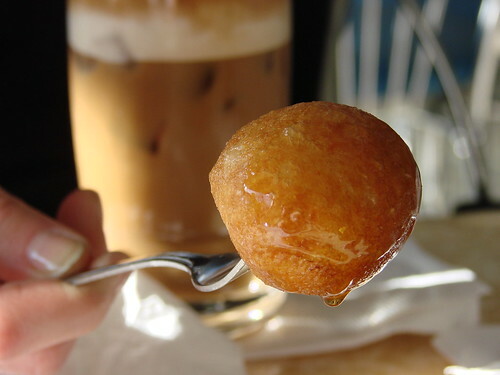 Take advantage of this opportunity to get some loukoumades--Greek honey soaked doughnuts at Lefkos Pirgos in Astoria. 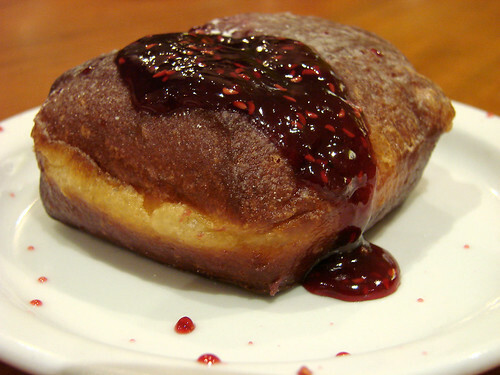 Sullivan Street Bakery: The Jam Filled Bomboloni from Sullivan Street Bakery are like jelly doughnuts all grown up. Sweet and delectable without being cloying, this is a mighty fine doughnut. Can't bare the idea of a walk to 10th avenue in the freezing cold? The 'wichcraft at Rock Center also has them available. Norma's: It's Fat Tuesday every day at Norma's in Le Parker Meridien where you can get breakfast 7 days a week from 7:00am until 3:00pm. Their pancakes are steep, think $19 to $20 for: Norma’s Super Blueberry Pancakes with Devonshire Cream, Country-Style Buttermilk Pancakes with Juicy Georgia Peaches and Walnuts, Banana-Macadamia Nut Flap Jacks with Whipped Banana Brown Sugar Butter, Buckwheat Pancakes with Lemon Mousse, Hot Chestnut Pancakes or Potato Pancakes with Homemade Cranberry Apple Sauce and Sweet Carrot Payasam, but if you are looking to really, really looking to indulge, this is the place. 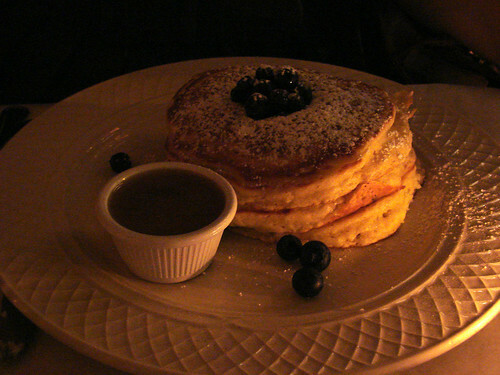 Shopsin's: Hands down my favorite pancake spot in New York City, Shopsin's delivers the goods. No ingredient is safe from the pancake form and there's nothing wrong with that. Highly recommend apple cinnamon pancakes and the slutty cakes. I wish the ho cakes (corn meal, pignoli,caramel hearts) were still on the menu. If you are in a savory mood, give their famous mac and cheese pancakes a try. 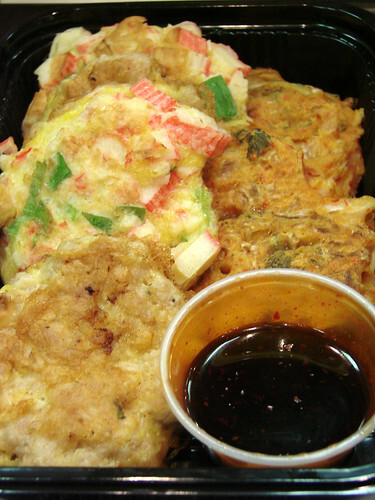 Speaking of savory pancakes, I'm always a fan of the assorted pancakes (scallion, kimchi, and pork pancakes) from Woorijip. Fast, cheap and in pancake form, what more could you ask for? And if free pancakes are your cup of tea, IHOP is giving out a free short stack of buttermilk pancakes from 7:00am until 10:00pm. BTWs, gingerbread and MEYER LEMON doughnuts are available at Doughnut Plant, or at least they were available at the Joe in Grand Central from the Doughnut Plant. And lolz Bear, you know you love us! I have been meaning to try out Doughnut Plant for a while. I think I need to get over there this weekend - those doughnuts look (and sound) amazing.